A powerful being who claimed to be Apollo. 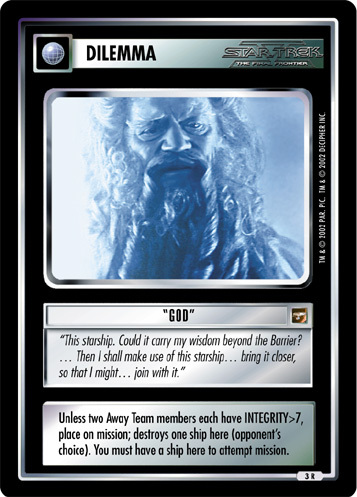 Appeared in the classic style and performed "god-like" acts, but failed to convince the crew of the Enterprise to worship him. Unless two Away Team members each have INTEGRITY>7, place on mission; destroys one ship here (opponent's choice). You must have a ship here to attempt mission.